I'm going to be frank, and I'm going to be simple, we were put on this planet to Love and Be Loved. At the end of the day, that's what it comes down to. We were meant to Talk before we Judge. We're to value what we have, and share it with those who don't. But somewhere a long the line, we really screwed the pooch on that one. 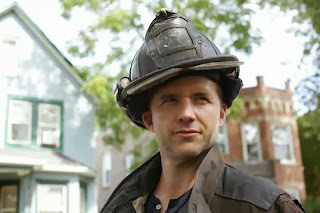 Now I love the TV show Chicago Fire. With CSI New York having finished it's run. This is the show that speaks to me. It's Character Jeff Clarke has also inspired this particular blog post. so Shout Outs: to Jeff Hephner for playing him as well as the awesome cast and crew that make this show happen. Now I've learned that it's not all about me. My misadventures in the world of bullies, fisticuffs and badly dealt hand don't always compute. At times I need to be relevant. Now this pretty fellah is a Firefighter named Jeff Clarke( Jeff Hephner) from Fire House 51, a character from Chicago Fire. As I've been enjoying this fabulous show and falling into the various plot points of the show. I've been looking at Jeff's character in particular and the reactions of the Fire House in general. He's this new guy, from a shut down fire house. He's come in and upset the balance of house 51 just by being there. He's quiet and just a bit mysterious. He also does his job, he's good at what he does and without doubt the rest of the house are glad he's there on a call. But things start going wrong and evaluator tasked with potentially shutting down the house, starts finding out things that somebody from inside would of had to tell her. He's branded a snitch. As you'd imagine, Clarke in essence gets bullied by the boys and girls of House 51. He's excluded and I imagine poor Clarke ate his meals alone and was left out of the camaraderie that comes with being part of a team and family. Now in spite of all the bullying and cold shoulders, Clarke still had his less than friendly teammates backs and even covers Mills' back by bringing back a tool he'd left behind. Now granted this is a turning point for Clarke' character on the show. But what made this character arch really stick out. Was the fact, nobody actually took the time to talk to Clarke. At the very core, Jeff Clarke is a character that resonates with every child or adult facing bullying. A small beacon of light that things will get better. But it paints a stark lesson about judging somebody's character without ever doing your homework. So next time you think to judge somebody, because of something you maybe thought you saw, or something somebody said, Find that person and talk to them. Because they could be your Fire Fighter Jeff Clarke.